When the fresh figs started to be more freely available for me in countries further north from Turkey I hesitated for years before I was ready to buy them. Not sure why exactly. The figs were foreign, not a normal fruit for me. Perhaps one of the reasons was that I was not sure if the skin was edible or not. I knew that the dried figs were eaten as whole, but somehow the fresh fig looked different, delicate under the dark skin. 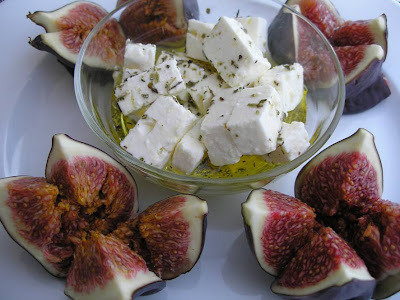 At one point I got over my fear of raw figs and dared to try. The fig with sweet seedy inside and the smooth neutral cool thick skin makes it a perfect ingredient in desserts as well as in savoury pairing with cheese or thinly cut cured ham. Dared to try and the fresh figs have become a desirable treat whenever they are in season and I see the ripe bulging fruits on the shelves of good food stores. For a light lunch or a starter per person take 4-5 ripe figs, cut into quarters. season with oregano and/or thyme and add some olive oil to the cheese. Let the cheese rest in the oil for 15 minutes to take up the flavour from the herbs. Parma ham, jamon iberico or any cured meat tastes good in combination too.